Physical therapy focuses on helping children of all ages become as independent and fit as possible with respect to strength, endurance, balance, coordination and mobility. This includes in the home, community, school and playground. 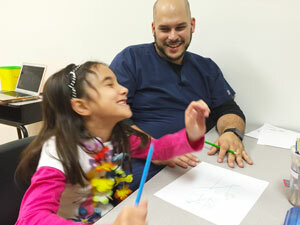 At Kinetic Kids, our therapists draw from years of expertise in a variety of pediatric physical therapy approaches. We focus on enhancing your child’s development, restoring function and preventing disability from pediatric conditions, illness or injury. Physical therapy is also aimed at the prevention of injury by teaching proper use of the body during movement, as well as how to move safely and efficiently while at work or play. Our physical therapists often make recommendations regarding the use and fit of adaptive equipment as well as other accommodations to enhance proper positioning, skill acquisition or increased mobility in an effort to further promote functional independence. Parent and family education and training are also an essential part of our therapy programs.